this is my newest favorite project! of building my own fantasy world. as blueprints i used drawings which were inspired by this fabulous print called Frog by Francios Houtin, a Parisian etcher, draughtsman and print maker. i think it is easy to tell he has spent time as a gardener. 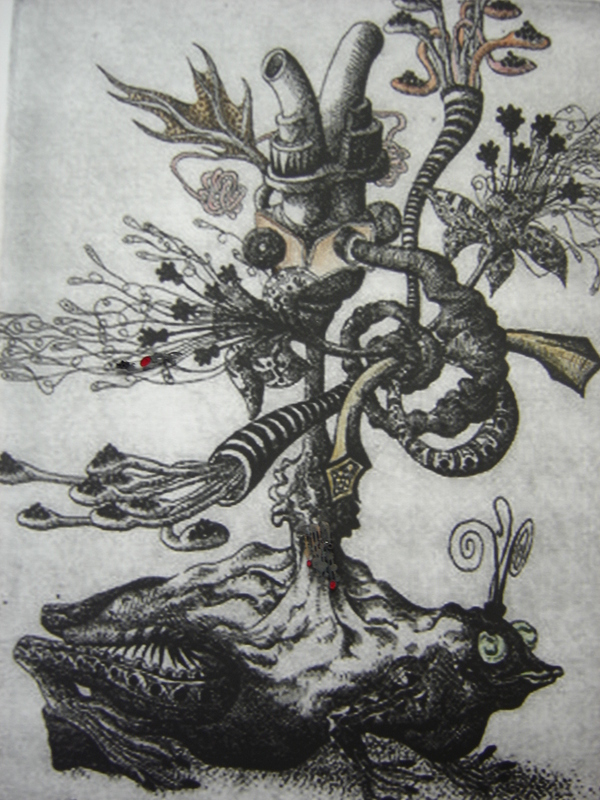 i am really intrigued by his early etchings (70s) and the shapes he uses. they seem to be begging to be interpreted as jewellery. i first came across his work on bibliodessy and have been a fan every since. Check out more of his work at these galleries. Richard Reed Armstrong Gallery (or if you live in chicago you can go see it in real life!!) and Galleria del Leone. This entry was posted in inspiration on April 6, 2007 by kristindagostino. Forget owls – planty frogs are my new favorite favorite animal. Unless, of course, they make planty owls.